DES MOINES - With some late game heroics and a little bit of luck, the Iowa Barnstormers (3-0) defeated the Nebraska Danger (1-3) 58-55 on Saturday, March 23 at the Heartland Events Center in Grand Island, Nebraska. In the first quarter, neither team could be stopped on offense. The Barnstormers scored on the opening possession of the game, when running back Jamal Tyler ran it in from six yards out. Kicker Nathan Criswell nailed the PAT, 7-0. Danger quarterback Tommy Armstrong Jr. found receiver Quincy Walden in the end zone and the extra point was good, tying the score 7-7. On the next possession quarterback Daquan Neal hit receiver Ryan Balentine from nine yards out, putting Iowa up 14-7 after a successful PAT. Nebraska again answered back, scoring on fourth and goal from the one-yard line and tying the game 14-14. Before the quarter came to a close, Neal found Balentine streaking down the middle of the field for a 29 yard touchdown pass. Criswell again made the extra point, 21-14. To start the second quarter, Nebraska answered back. This time the score came from running back Davonte Sapp-Lynch’s touchdown run. The PAT was no good, 21-20. The Barnstormers were finally held to a field goal attempt and Criswell knocked it through to extend the lead, 24-20. Sapp-Lynch answered with a long touchdown run, putting the Danger up 27-24. Neal hit Balentine again to re-take the lead, 31-27. Armstrong Jr. had a 10 yard touchdown run in the final seconds to launch the Danger back on top. A missed extra point from kicker Renaud Labrecque resulted in a 33-31 score at halftime. The third quarter was much slower than the two preceding it. The only score by Nebraska came when Armstrong Jr. hit receiver Eric Thomas. After a missed PAT, the Danger held a 39-31 lead. The Barnstormers answered on the following drive when Neal scored on a six yard touchdown run, 39-38. 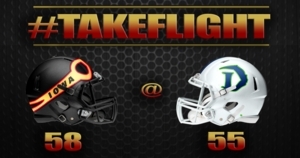 Labrecque hit a field goal to extend the Danger’s lead to 42-38 to start the fourth quarter. Neal would again use his legs on a two yard touchdown run. After a failed two point conversion, the Barnstormers led 44-42. The lead was short lived as Sapp-Lynch scored on a four yard touchdown run. The two point conversion attempt was stopped and the Danger re-took the lead 48-44. Again, Iowa took the lead back. Neal scored on the ground for the third time on the night, 51-48. With over a minute remaining in the game, Sapp-Lynch evaded tacklers and ran 25 yards to score, 55-51. Neal made the play of the game backed up in his own end zone with time winding down when he avoided multiple defenders and heaved a deep ball to receiver Connor Hollenbeck. Hollenbeck dove in the end zone for a touchdown, giving Iowa a 58-55 lead with 18 seconds remaining. Labrecque had a chance to tie it for the Danger, but missed wide right. The Barnstormers look to continue their winning streak on March 30, when they travel to take on the Cedar Rapids River Kings. Kickoff is set for 7:05 p.m. CST. Season Tickets are on sale for the 2019 Iowa Barnstormers season. Fans can select the same great seat for every remaining home game. Don't miss a minute of the action! Call 515-633-2255 for more information.